All about Abraham Lincoln and Springfield | Bonjour, amigo! ← Wilderness Resort is really fun! I love Abraham Lincoln so much. We went to Springfield, Illinois just for me to learn about him. He was the 16th president. I even got two books about him for Christmas. I think they are very cool. He was a very important president because he was honest and he freed all the slaves. 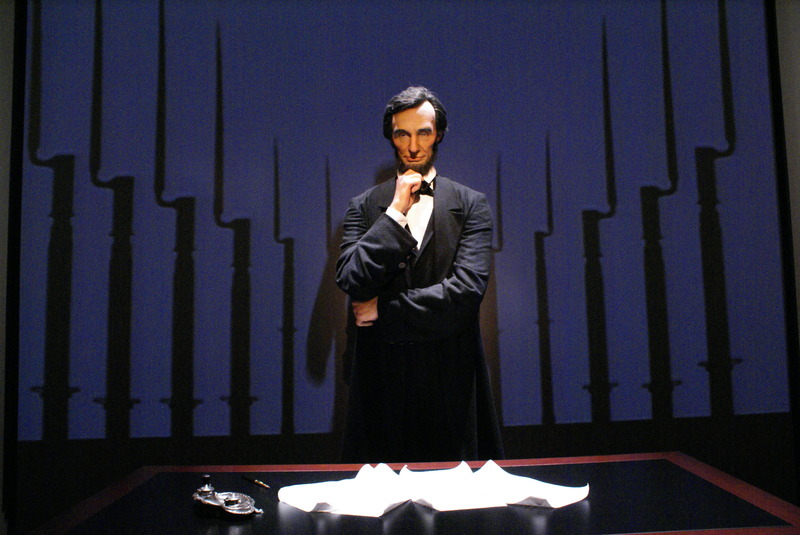 I was excited to go to Springfield so we could go to the museum that is only about Abraham Lincoln. We saw his cabin, but it was only a statue. We could go inside and we saw a loft and there was an arm hanging down from it. We heard someone snoring and we also found a bed. There was also a campfire. Everything in Springfield was very, very cool. Then we saw the White House and there were lots of dresses, but we did not see Abraham Lincoln in there. We saw the kitchen and everything that was in the White House. Then we went on to the theater where he went and saw a play. Abraham Lincoln was sitting on the balcony. One of the actors, named John Wilkes Booth, sneaked up on him and shot and killed him. That was very sad. Everybody else loved Abraham Lincoln but the people who had slaves did not agree with him. John Wilkes Booth did not like Abraham Lincoln because he freed all the slaves. Another placed we visited in Springfield was the house where Abraham Lincoln actually lived in real life. We went on a tour there with a National Parks Ranger. We saw the whole house and it was super cool. 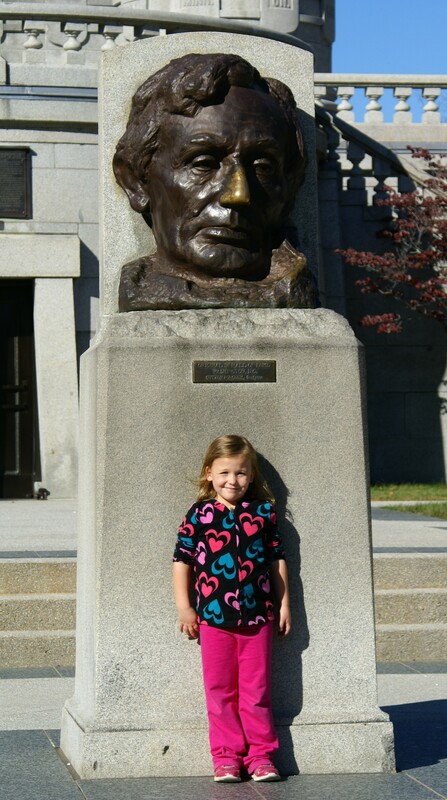 We also went to the cemetery where Abraham Lincoln is buried. There is a statue there of his face and we rubbed his nose for good luck. It’s made of copper, just like the penny. So many people rubbed his nose that the color wore off and it looks gold. I loved everything we saw in Springfield. I wish we could go back and see some more. This entry was posted in Abraham Lincoln, My trips and tagged Abraham Lincoln, Illinois, Springfield. Bookmark the permalink. What a great post. We would love to find out more about Abraham Lincoln and visit too, but it is a really long way from England! We love your post though, and if you take a look at our blog, you will see lots of blog posts written by Jess and Rob, who are nearer your age than your mum’s! I was in Springfield not long ago, but it was a photo outing and I only got to see a fraction of what you did. So cool that you like President Lincoln – hope you get to visit the city again soon. Springfield is one of those places I have driven through hundreds of times, but never stopped. Thanks for the inspiration to visit. I will think twice next time the speedometer reads 75 mph heading south. Pingback: The Working Mom's Travels turns 5 + a family trip giveaway!